Typically, I don't eat a big dinner. Instead I'll usually have more of a snack. 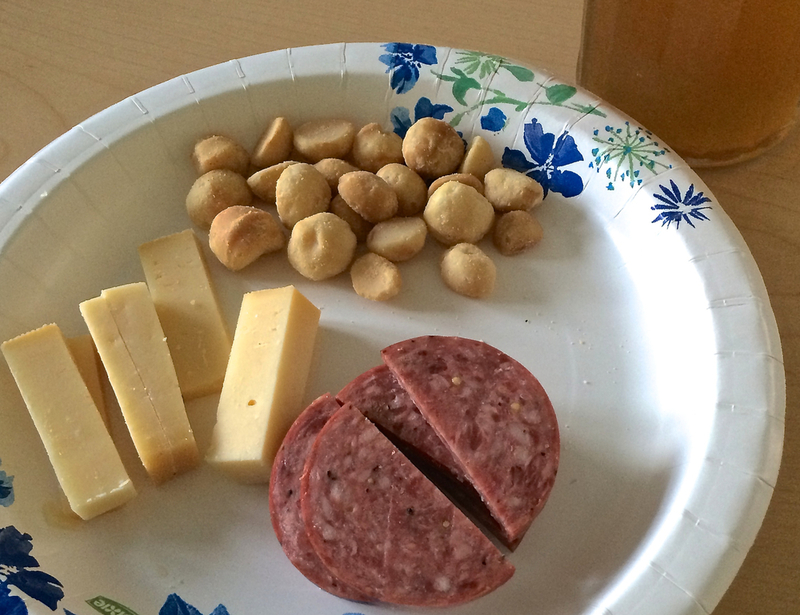 In this case, I feasted on some slices of summer sausage, some pieces of aged Gouda cheese, some macadamia nuts, and a glass of homemade Kombucha tea. This meal is good from a macronutrient perspective because it's very low in carbohydrate, has some protein in the sausage and Gouda cheese, and a little in the nuts. Plenty of good fats are in the sausage, cheese and nuts. For Quality, it's not bad either. The source of the meat is unlikely grass fed or anything, but the Gouda cheese I get is from raw milk, although it isn't likely from grass fed cows. As far as micronutrients, it's also pretty good. The cheese, being an aged Gouda, is a rare source of vitamin K2. The sausage would contain plenty of parts of the animal that I might not normally eat, (you know, you don't want to see how sausage it made) so there are some great micronutrients from that. However, since it's from an unknown source, it may not have the best micronutrients in all cases or toxins such as antibiotics and hormones. The Kombucha is loaded with active probiotics and other micronutrients and since I made it myself, I know the source and I know it contains live cultures. Overall a pretty easy, quick, and healthy meal/snack.